At Capital City Curb and Gutter, we offer the highest quality and most competitive rates on all commercial concrete services. Our team of concrete experts handles all jobs including parking lots, sidewalks, retaining walls, overlays, and more. We offer professional, punctual, and full installation done exactly to your specifications to achieve the best possible results. This makes our team one of the most trusted in North Carolina. 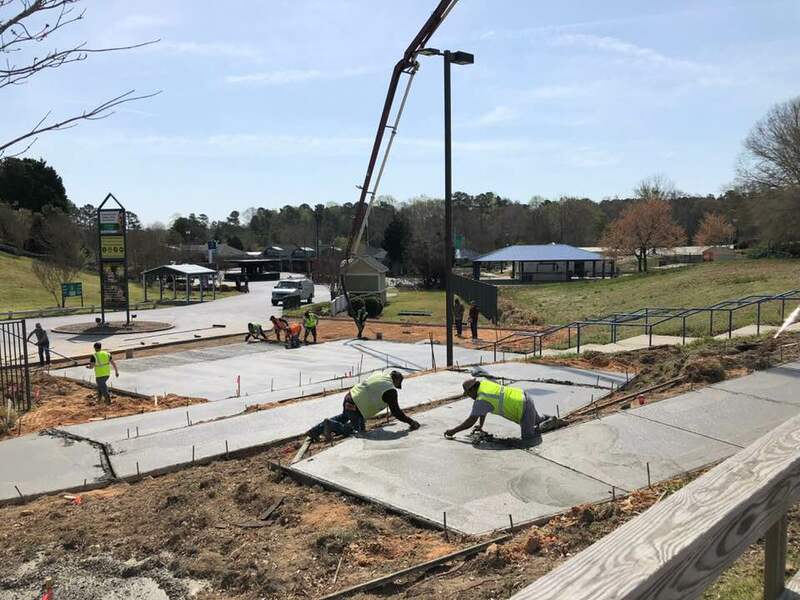 We’ve been serving North Carolina’s concrete needs for many years and look forward to adding your business to our growing list of satisfied customers. When you need concrete services for your business done right, look no further than Capital City Curb and Gutter. Concrete is easy to maintain and clean, making it the top choice for businesses in the area who need a new parking lot, sidewalk, or numerous other amenities. Unlike asphalt, concrete doesn’t require crack sealing or seal coating to keep it looking new and fresh. Concrete is known for it’s durability and doesn’t crack or form potholes easily. In fact, it’s quite a rare occurrence for these things to happen, making concrete a very low maintenance option. Concrete is also very easy to clean. A quick pressure wash will have your parking lot or sidewalks looking clean and healthy for years to come. Don’t put your concrete needs into the hands of inexperienced contractors or businesses. Concrete that is not installed correctly will result in an improper or uneven appearance, and will create a world of maintenance and upkeep issues down the line including cracking and fading. Get it done right the first time with Capital City Curb and Gutter. Our team of highly trained professionals have years of experience designing and installing the perfect concrete solutions for your business. When you trust your business to us, we will handle everything from the design to the installation so that you can sit back and relax knowing you made the best possible choice when choosing us as your concrete solution. Capital City Curb and Gutter is the best choice for commercial concrete services for your business. We serve North Carolina, South Carolina, Virginia, and surrounding areas. We can give you an estimate for any job, no matter how big or small. Trust our years of experience and let our professional team design and install the perfect concrete solution for your business. Call us at 919-876-5155 or Contact Us Online for more information.